The blurb drew me in and I couldn't wait to read this book. The story is super sweet, but in the same sense, I didn't really like the two main characters. Brendon was so arrogant and self-centered and Matt just rubbed me the wrong way for some reason. I couldn't connect with these guys. I tried, because who hasn't filled out those surveys in magazines? Well, now online. Great idea, just not good execution in my opinion. It was a fast read; even though I didn't connect or love the book, it was a fast, sweet read that I am sure lots of people will enjoy. This is a very sweet romantic comedy. It feels like a fiction version of a classic film romcom featuring Meg Ryan or Reece Witherspoon. It is a self-aware story – Brendon is a huge romcom fan and he takes his inspiration from the classics. For Quinn Anderson, this is quite a departure from her Murmur’s Inc books – this is almost adorably cute and it lacks the undercurrent of edgy social commentary in her earlier books. I personally prefer the slightly darker humour in the Murmur’s Inc stories, but this is an easy, fun, and relatively low heat romance that will have a broad appeal. Brendon is a bit of a mess. A cosmetology student by night and a mall kiosk worker by day, he’s not the most focused or driven character. His life is pretty simple. He is image conscious and pretty superficial. I’m not sure I’d be friends with him and I’d probably never date him – but he is immediately recognisable and he’s an original and quirky choice for a leading man. I feel like I have dated Matt before – and regretted it. Brendon falls for his sophisticated hipster tastes, but I couldn’t get past his judgemental attitude. However, as much as these two men aren’t for me, they are pretty perfect together. Beyond Brendon and Matt, I really loved Brendon’s friends, Sasha and Areesh. The couple’s dubious dating advice adds humour to the story and they somehow make Brendon a bit more likeable. This is a fun and sweet romantic comedy. It’s a little bit too cute for me, but it is well written and there will be many readers who will fall in love with Brendon and Matt’s story. Brendon is a stylist-in-training, having too much time on his hands working at a mall kiosk. While taking a quiz in a local magazine, he feels drawn to the man who created it, Matt. The quiz mentioned Brendon's favorite places, date locations, and spoke to his heart. Brendon becomes a stalker, adding an awkward hilarity to the novella. I suffered from a few bouts of vicarious embarrassment alongside Brendon as he hunted down Matt. In this sweet yet awkward novella, the reader is taken on a full journey, proving love is perfect, but the ones in love are perfectly flawed for each other. Brendon and Matt are a good balance, with a few stumbles along the way that added a realistic edge to the story. The author hit many emotional notes for me, focusing heavily on the couple and no outside forces. I blushed and covered my face with Brendon, and Matt even had my heart skipping a few beats, in both pain and happiness. Recommend for readers needing a sweet injection of romance, not heavy on the angst but realistically written. I cannot wait to get my hands on what the author writes next. 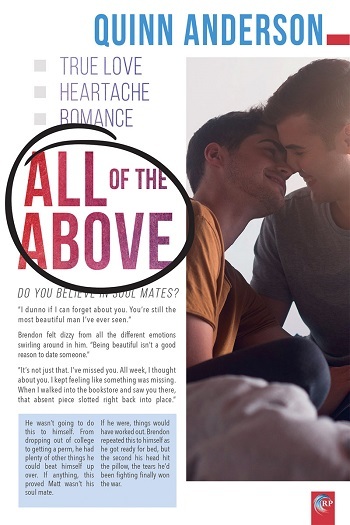 Reviewers on the Wicked Reads Review Team were provided a free copy of All of the Above by Quinn Anderson to read and review.